Apologises for being out of action here. I’ve been busy with life admin in general.. but more importantly, settling back into London and getting fully immersed into student life once again! It’s taking me a while to get used to spending 3 hours of my day on public transport after intense lectures. Enough about me! 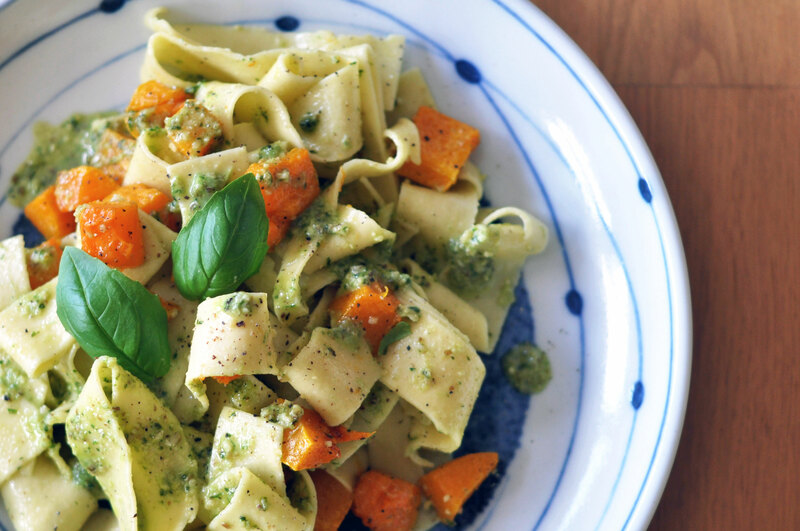 Let’s talk about this Butternut Squash and Walnut pesto Fettuccine. I love roasted vegetables, but nothing beats roasted butternut squash. Its texture develops beautifully under the grill and with a sprinkling of salt and pepper, its flavour sings. You’ll have to forgive the look of the pesto in my photos as I went a little OTT on the food processor. It was supposed to be a little on the chunkier side. As everything is so smooth and creamy, a little crunch is needed in this dish. I threw in one or two cloves of garlic in the pesto even though the recipe didn’t call for it. Come on, who doesn’t like garlic? Preheat the oven to 200°C. Place the butternut squash onto a tray lined with a baking sheet, drizzle with oil and season with salt and pepper. Roast for about 20 minutes or until tender. For the pesto, toast the walnuts in a pan for 2-3 minutes. Make sure not to burn them or else you’ll end up with bitter pesto and that ain’t yummy. Throw the walnuts, oil, basil, cheese and half the rocket leaves into your food processor. Blitz until you have a coarse pesto. Meanwhile, cook your pasta until al dente. I won’t be patronising here to tell you how. Once the pasta is cooked, drain and keep a little of the cooking water. 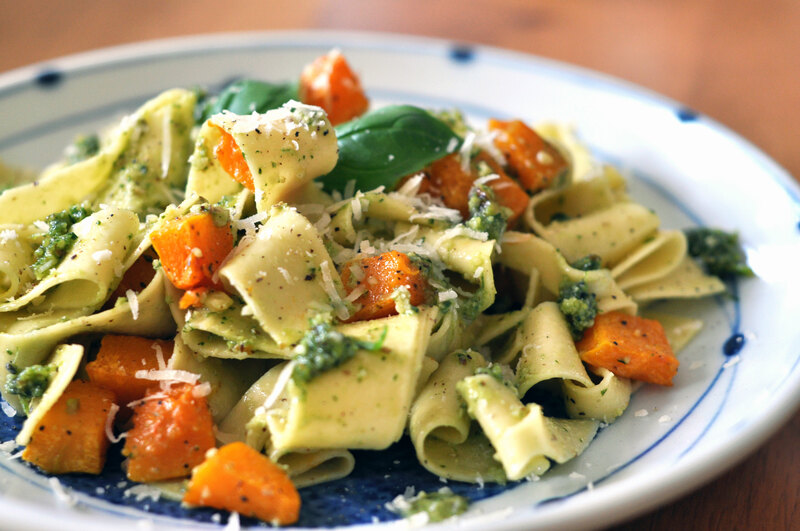 Return the pasta to the pan, toss in the cubes of butternut squash and drizzle over the pesto. Gently toss together, adding a little of the cooking pasta water to loosen the sauce if need be. 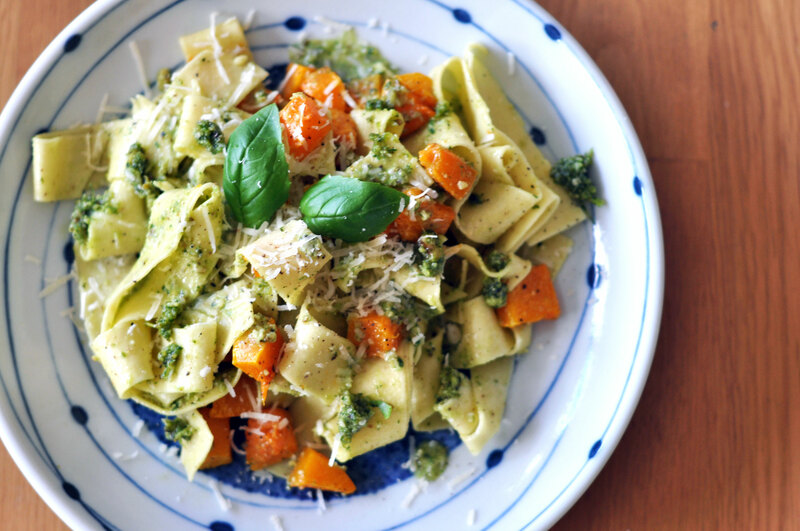 Serve with a sprinkling of rocket leaves (or in my case, basil leaves) and plenty of parmesan! If you’re all about eating clean, do check out the Healthy Breakfast Frittata featured in the book as well. Don’t forget to share if you’ve tried these recipes out and tell me all about your yummy versions!